On November 13, 1881, a small group met at the home of Mr. and Mrs. S. T. Foster (Justice of the Peace) to organize First Baptist Church. Dr. O. C. Pope, of Houston, and Elder W. H. Dodson of San Antonio, came to assist in the organization. Charter members were Mr. and Mrs. O. H. McClane, Thomas F. Martin, Mrs. J. W. Buxar, Mr. and Mrs. S. T. Foster, and Mr. W. M. Flourney. All these members came on promise of a letter from their former churches. Elder John D. Wright, of Austin, was called as the first pastor. Services were held in the Foster home until a church building could be built. Three months after the church was organized, the membership voted to change the name to Creath Memorial Baptist Church. 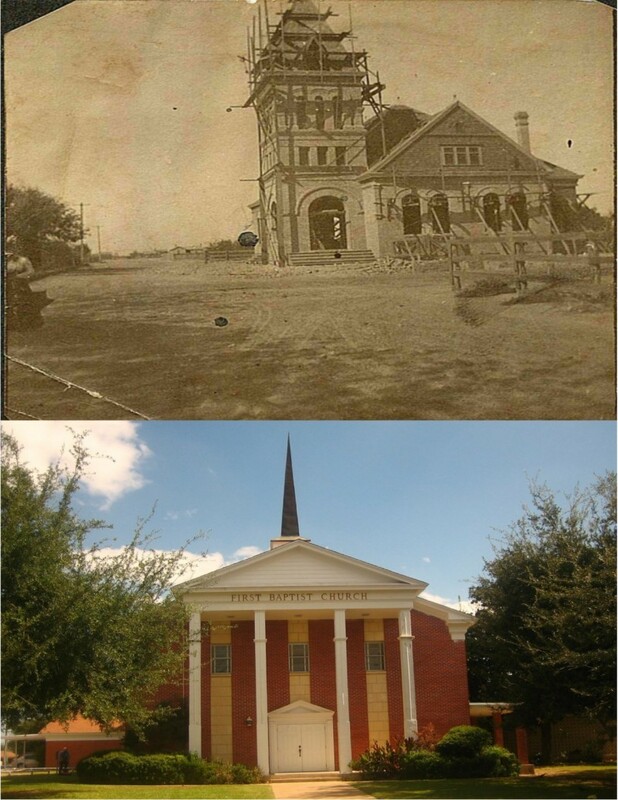 In 1888 a church building was built on Matamoros Street. The Ladies Aid Society was started in 1887. It was through their efforts the first building was built. They raised funds through sewing, quilting, and local projects. The first baptism was held on February 19, 1888. In the early 1890’s a parsonage was completed, a Sunday School Superintendent and assistant were elected. Also the first deacon, R. C. Randal, was elected at this time. In 1891 furniture, pews, chairs, pulpit, etc. were ordered. The First Baptist Church has always been mission minded. It’s first mission project was to help the Baptist Church in Cisco, Texas whose building had been destroyed by a cyclone. They also helped with Buckner’s Orphan’s Home and the local Mexican Baptist church. The first recorded marriage was in the early 1890’s. Records for the first part of the 20th century have been lost. But we do know a larger church building was built. The first service in the new building was in November 1901.